Using a metered-dose inhaler (MDI) seems simple. But many people do not use them the right way. If you use your MDI the wrong way, less medicine gets to your lungs and most remains in the back of your mouth. If you have a spacer, use it. It helps get more medicine into your airways. Shake the inhaler hard before each use. Look inside the mouthpiece and make sure there is nothing in it. If you have not used the inhaler in a while, you may need to prime it. 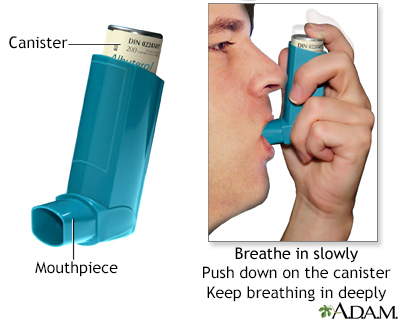 See the instructions that came with your inhaler for when and how to do this. Breathe out all the way. Try to push out as much air as you can. Hold the inhaler with the mouthpiece down. Place your lips around the mouthpiece so that you form a tight seal. As you start to slowly breathe in through your mouth, press down on the inhaler one time. If you can, hold your breath as you slowly count to 10. This lets the medicine reach deep into your lungs. Breathe out slowly through your mouth. If you are using inhaled, quick-relief medicine (beta-agonists), wait about 1 minute before you take your next puff. You do not need to wait a minute between puffs for other medicines. Put the cap back on the mouthpiece and make sure it is firmly closed. After using your inhaler, rinse your mouth with water, gargle, and spit. Do not swallow the water. This helps reduce side effects from your medicine. Look at the hole where the medicine sprays out of your inhaler. If you see powder in or around the hole, clean your inhaler. Remove the metal canister from the L-shaped plastic mouthpiece. Rinse only the mouthpiece and cap in warm water. Let them air dry overnight. In the morning, put the canister back inside. Put the cap on. DO NOT rinse any other parts. Bring your inhaler to your clinic appointments. Your doctor can make sure you are using it the right way. Store your inhaler at room temperature. It may not work well if it is too cold. The medicine in the canister is under pressure. So make sure you do not get it too hot or puncture it. An inhaler is a quick way of administering medicine directly into the bronchial passageways to promote clearer breathing. Reviewed By: Laura J. Martin, MD, MPH, ABIM Board Certified in Internal Medicine and Hospice and Palliative Medicine, Atlanta, GA. Also reviewed by David Zieve, MD, MHA, Medical Director, Brenda Conaway, Editorial Director, and the A.D.A.M. Editorial team. 01-22-19: Editorial update.